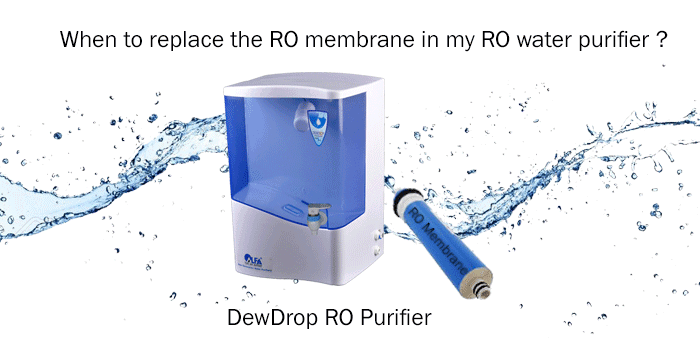 Home » Blog » When to replace RO (Reverse Osmosis) membrane in my RO water purifier ? When to replace RO (Reverse Osmosis) membrane in my RO water purifier ? Reverse osmosis ( RO) is one of the most effective technologies to purify water which has high TDS levels of more than 500 ppm. Reverse Osmosis (RO) is a separation technology where dissolved impurities in water are separated by way of a semi-permeable membrane (RO membrane) which works under high pressure. As such, the RO water purification system can be used for both – home as well as for commercial purposes. Constituents of dissolved solids and impurities (TDS) are calcium and magnesium salts, nitrates, iron, lead, fluorides, arsenic etc. Such dissolved impurities are usually found in ground water, i.e water that is drawn from beneath the surface of the earth. In cities, ground water is distributed by water tankers to areas where municipal pipelines are absent or where demand exceeds supply. While minerals including calcium and magnesium are good for the body in permissible limits, other impurities may cause harm in the long run. Reverse Osmosis membrane is an integral part of the Reverse Osmosis system. The RO membrane is a thin film made up of microscopic pores. In normal operation, the membrane in reverse osmosis elements can become fouled (contaminated) by mineral buildup, biological matter, colloidal particles and insoluble organic constituents. Besides fouling, membranes can get clogged to the extent that they cause a drop in the output of purified water; or become ineffective in removing the salts effectively, or both. Because of this fouling problem most RO purifiers – home as well as commercial RO water purifiers have UV purification post membrane to eliminate the chances of contamination. To protect the delicate RO membranes, and to extend the life and prevent frequent fouling, water should first flow through a pre-filter. The pre-filter cartridge will filter out dirt, silt, sand and other suspended sediments. This pre-filter should be changed every 6 – 9 months; this, however, depends greatly on water quality and usage. If not properly back flushed and maintained, this pre-filter can foul or get clogged, and thereby reduce the life of the RO membrane. Chlorine in water will also affect the life of the RO membrane. Therefore an activated carbon pre-filter is normally placed before the membrane to adsorb free chlorine and thereby extend the life of the RO membrane. Dewdrop RO water purifier from Alfaa UV has a carbon pre-filter preceding the RO membrane this protecting the RO membrane .It is very important for the pre-filter to be changed regularly in order to prevent membrane from giving off foul smell, or degrading; as part of regular maintenance. It is advised that Reverse Osmosis membranes be replaced every 2-3 years or based on actual usage, consumption and water quality. In high TDS areas, the RO membrane may need replacement more frequently. The specification of the RO membrane must be matched as per the quality of water. For example, if the capacity of an RO membrane is to purify up to 1000 ppm of TDS, passing water higher in TDS than the recommended level will reduce its life. For optimum efficiency of RO membrane, routine maintenance should be performed on Reverse Osmosis systems. RO systems should usually have three, four or five filter stages. RO water purifiers are an expensive but excellent way to purify water high in TDS. Servicing is also an expensive proposition, as pre-filters and membranes are costly. Besides the cost, RO membranes used in residential water purifiers normally reject 70-80% of water and therefore wastage of water is high. The mantra should be: use RO purifier only when the TDS in water is high and the taste of water undesirable. Otherwise, cost, service and wastage implications in an RO will outweigh any benefits. For effective disinfection of water low in TDS, simply opt for a 5 stage UV purifier. Ewater – UV Home Water Purifiers from Alfaa UV is India’s first 5 stage UV purifier capable of giving you clean, safe purified water at a fraction of the cost and with lesser servicing requirements. Great post! That is the type of information that are supposed to be shared around the web. Disgrace on Google for not positioning this publish higher!